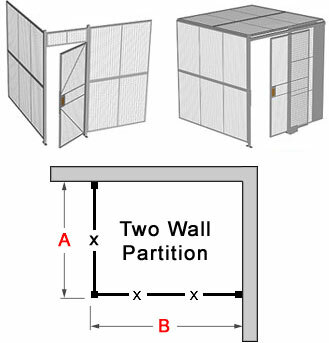 Two-Wall Partitions are designed to fit into a corner, providing a secure area utilizing two building walls and two wire mesh walls. WALLS: Your facility wall must be able to accommodate anchoring wall or ceiling panels to utilize a 2-sided partition without at-wall post connections. Posts at the wall are recommended for: Dry wall, gypsum, or metal walls. Panels may connect directly to: masonry, block, and some wood walls. Adding posts at the wall will increase the price of your partition. If you are not sure of your needs, Customer Service can assist you. For assistance specifying your wire partition system, contact Cisco-Eagle customer service toll-free. We can help you design a unit exactly to your needs, including options not included in these standard units. For quote assistance on a 2-wall unit, submit this easy-to-use Quote/Configuration form.